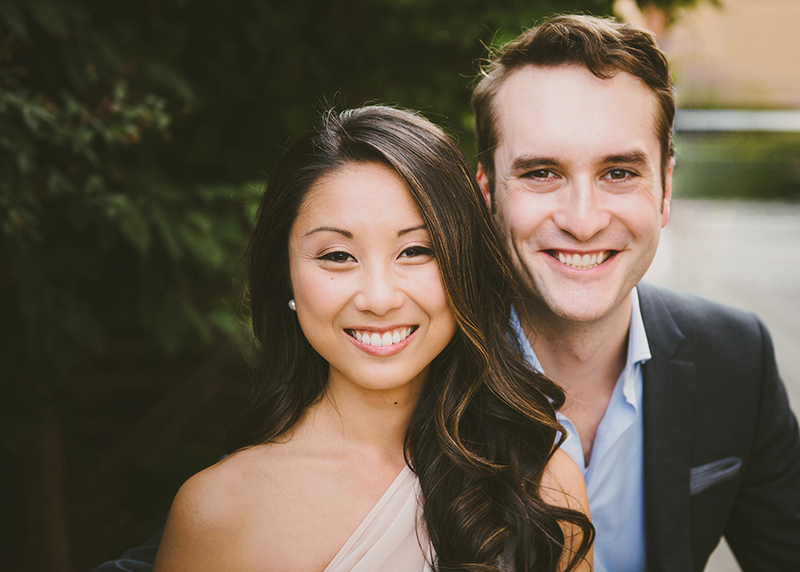 Ainah and Mike are an amazing couple! They knew immediately that their engagement session should start where he’d proposed, which was at the High Line. This was my first time ever shooting there, and while I had some anxiety over the potential crowds, it turned out to be one of my best engagement shoots ever! We met a few blocks away and started walking towards the entrance, all the while chatting about the proposal. I started making my way up the stairs to the park, when I noticed Ainah and Mike had parked their belongings at the foot of the stairs. Confused, I asked why they’d stopped. I was sure Mike had picked a gorgeous spot on the High Line to propose, but here we were in a little vestibule at the entrance. Well, it turns out that he had planned on proposing inside the park, and had taken Ainah there for the big moment after an evening out – not realizing that the entrance closes at sunset. Not to be deterred from his grand plans, he dropped to a knee right there at the foot of the stairs. That’s where it happened, so that’s where we shot! They both cracked up re-telling me the story, and I could tell that it didn’t matter to Ainah where Mike proposed, she was definitely going to say yes!